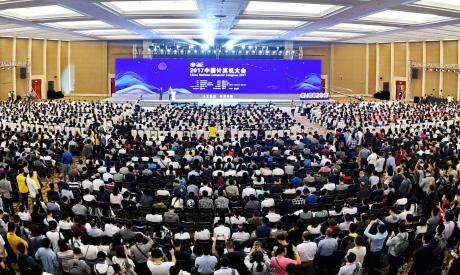 Guests attend the 2017 China National Computer Congress in Fuzhou, capital of southeast China's Fujian Province, Oct. 26, 2017. Lin Shanchuan/PA Images. All rights reserved.In 2010, Google pulled out of China amid pressure from the Chinese government. In the West, the story was about a backward-looking authoritarian state rejecting innovation and strangling freedom of expression. Did China get it right? You certainly don’t see many newspaper stories about China’s vindication. Then Edward Snowden showed the world that vulnerabilities in Google’s internal systems were enabling the NSA’s mass surveillance. Maybe China had a point about a US corporation collecting vast amounts of data about its citizens. Now we’ve seen Russia try to use a sock puppet army to manipulate elections in Europe and the US, another very good reason why a country might want to regulate its own digital sphere. Did China get it right? You certainly don’t see many newspaper stories about China’s vindication. It would be naive to think that the Chinese government was only motivated by a benign intent to protect its society: it’s also an authoritarian state strangling freedom of expression. But repression is not the only lesson to draw from the Google story. There are also lessons about pragmatic ways the state can deliver in civic digital technologies. China is a country where you can disappear for having the wrong opinion, but we have so few data points on how society should respond to digital technologies we need to take empirical evidence from wherever we can get it. Further, perhaps there’s a touch of hypocrisy in the way the west lectures the world about individual liberty while covertly monitoring social media and allowing our digital lives to be dominated by a handful of Silicon Valley monopolies. Here are two ways China is doing something interesting with digital democracy – surely there are many more. How about a society that rewards people for the good they do, taking into account not only their labour in the office or factory, but their hard work as a mother; not just the day rate they can command as a consultant but also the emotional labour of supporting a friend with depression. Sounds a bit authoritarian? Well, if you live in the west, you also have a score. China’s system of scoring citizens is… kind of… this: combining educational achievements, traffic infractions, financial behaviour and social media activity into one number that it publicly assigns to every citizen. It’s not clear what other activities will influence the number, but, as a piece of infrastructure, it has the potential to nudge your rating up for helping an old lady across the road. Sounds a bit authoritarian? Well, if you live in the west, you also have a score. The government secretly monitors your digital activity and assigns every citizen a number which indicates how likely you are to be a terrorist, or some equivalent process that has the same effect – obviously governments are not forthcoming about how these systems work. You also have a credit score, which is extremely analogous to the social scoring system. Except, rather than being delivered by a government, it’s run by big banks that are institutionally indifferent to ethics. In China, the social score policy is public and transparent, one idea is that your score might appear on your dating site profile; though you can obviously make a strong case that the social scoring system is illegitimate because it’s implemented by an unelected government. In the west, you can make a roughly equivalent case that scoring is illegitimate because it’s undertaken by banks, which are incentivised to reduce transparency, or in secret by the government. You have a vote, but in practice, it’s unlikely to give you a say about government spying or credit ratings. If China’s social scoring system goes ahead, it could provide valuable insights for similar ideas in the west, particularly on topics like alternative currencies and the need to value affective labour. If you are worried about an increasingly polarised society driven by filter bubble effects, again, China may have an answer. Deliberative democracy: where a group of citizens is invited to feedback to local officials on policy. Details vary, but normally a demographically representative group of people are selected to meet up and spend some time ‘deliberating’, discussing issues among themselves with access to impartial experts. At the end, a vote is taken and the results are either binding, or become recommendations. The principle that everyone gets to vote is the core of western democracy. At the moment, though, it’s undeniable that the electoral cycle has become an alarmingly centrifugal force, chaotically cartwheeling opinions to the extremes and tribalising the electorate. Deliberative democracy has two benefits. Firstly, in deliberative democracy voters are selected to be truly demographically representative, rather than just those that turn up to the polling booth, which inevitably tends to be the better off. Secondly, in deliberative democracy, participants have a chance to become informed and discuss issues in a structured way, bypassing the filter bubble. These are not features that are easy to ensure; if you insist that everyone must vote, it would simply be too resource intensive to give every single voter access to a deliberative process (though it has been suggested). Deliberative democracy has been tested in the west too, leading, for example, to oil-obsessed Texas making a significant investment in wind farms for electricity, after a deliberative process showed that consumers were less price-sensitive and more eco-conscious than expected. At the moment, the electoral cycle is become an alarmingly centrifugal force, cartwheeling opinions to extremes, tribalising the electorate. Deliberative democracy is usually applied to local issues, so rather than replacing existing democratic institutions, it can, in parallel with national democracy, improve the quality of local policy making. Just as with social scoring, but to a lesser extent, there are arguments about legitimacy in both directions – obviously, China isn’t a democracy. On the other hand, if your public sphere is in the hands of a few newspaper barons, Russian trolls and social networks that algorithmically deepen polarisation, then citizens' ability to vote in their best interests will inevitably be undermined by the flow of manipulative information. Deliberative democracy is not itself digital, but instead represents a way to legitimise new technologies and to improve an increasingly dysfunctional public sphere. So was China right to kick Google out? It’s unclear, but as digital technology becomes ever more embedded in society, these questions will become more and more urgent. We’ve seen it happen only recently: Transport for London (TfL), the institution responsible for regulating taxis in London, has questioned Uber’s fitness to operate a taxi company. A lot of civic tech people suggested that TfL should run its own Uber replacement. Those on the other side of the debate said that if London wasn’t open to Uber, it was against innovation, the free market and the future – the polarising echo chamber working as effectively as ever. When Uber tried to open in China, the government had no compunctions about setting up a local alternative, Didi Chuxing, which is doing very nicely. Unlike Uber, which mobilises its PR and legal teams to frustrate local democracy in the cities in which it operates, you can bet that Didi will act if the Chinese government tells it to sort out its safety record. China has, as a nation, gained control of its taxi infrastructure, but at the cost of unappealing centralisation. In response to Uber problems in London, Jeremy Corbyn, leader of the opposition Labour party, has suggested a cooperative model as an alternative – perhaps finding a path between the Chinese quasi-state led model, and the hyper-market-oriented view where rejecting Uber is synonymous with rejecting all innovation. China’s solutions won’t always appeal, but it faces similar problems to the west: working out what political institutions are best suited to managing digital technologies. If you believe that society is going to have to change radically in the face of technological innovation, it’s helpful to have somewhere radically different to draw lessons from – and China is well qualified in this respect.